Did you know that Google is constantly reinventing search results to be more useful for users? The ultimate goal of Google Search is to decrease the time it takes you to find the information that you are looking for by gaining a deeper understanding of the intent of your query. In other words, Google wants to know what you are looking for before you search for it. However, understanding a searcher’s intent is easier for some queries than others. 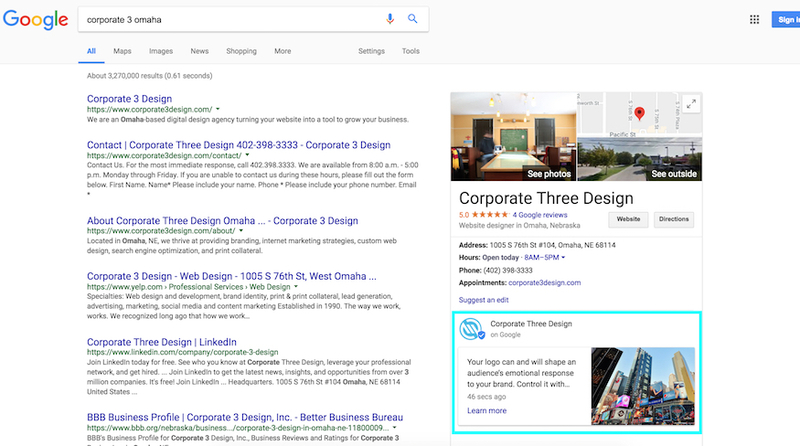 For example, if you searched for “Corporate 3 Design Omaha” then your intent is pretty clear. You are seeking general information about a business entity in a specific city. SEO’s refer to this as a “branded search” and for Google, it is one of the most straightforward types of search queries. When you perform a branded search like this, you will notice the entire first page of results typically contains nothing but links relevant to that company or entity. Google Posts are a very simple way to enhance the depth and quality of branded search results for your business. Why did Posts work so well for political candidates? They offered a perfect window into the action from the campaign trail within a branded search result. From voicing campaign issues to announcing your next rally, Posts provided a simple method of communicating with constituents about what was important on that week or day. Eventually, Google realized this would also be attractive for brands and small businesses on Google My Business. What’s Different About Google Posts? At the time this blog post was published, there is currently no method for automating the publishing of Google Posts on your Google My Business page (outside of the GMB API). This means that if you use social media automation tools like Buffer or HootSuite, you will have to actually navigate to your Google My Business dashboard and create the Post. However, I suspect it’s only a matter of time before this changes. 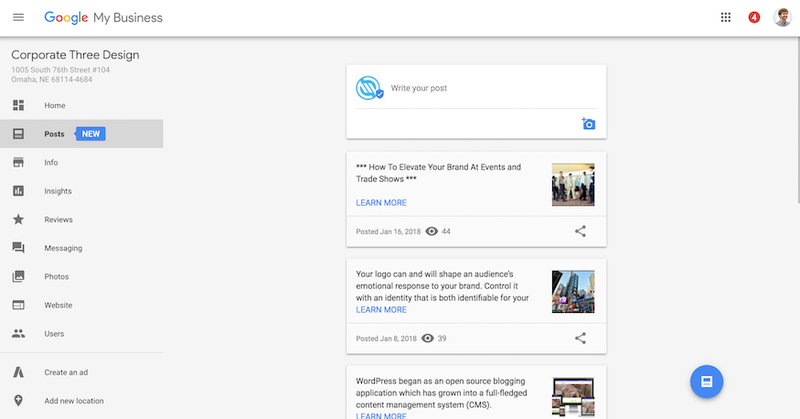 As a Buffer user myself, I would certainly enjoy the ability to plan and schedule Google Posts directly from my dashboard. Google Posts will automatically expire after 7 days. When your latest Post expires, it will stop being shown in search results immediately. You can also expect a reminder email from Google prompting you to create your next Post. I find these reminders especially handy because I manage Google My Business accounts for 20+ locations and they help me stay on top of a consistent publishing schedule. PS Don’t feel restricted by the 7-day expiration date. Depending on your target audience, you can try experimenting with a different frequency for your posts and also publish more than once every 7 days. Google Posts contain limited content compared to a say a full blog post on your company website. Posts can display a single optimized image and a short message that is limited to 100-300 words. Additionally, Google offers the ability to communicate a start/end time if your post is about an upcoming event or sale. Navigate to the Google My Business Dashboard for your business. Click on the section titled "Posts" on the menu on the left. Click the blue button in the corner to create a new Post. Add a photo and a short message along with a call-to-action. Check back in 7 days (or less) to view results. Can Google Posts Positively Affect My Local SEO Rank? There is anecdotal evidence based on some early data and research within the SEO community that suggests this new feature may influence your site's organic ranking for specific queries outside of branded searches. While I have not put this theory to the test, it would not surprise me. It's not uncommon for new features to be given more prominence in an effort to increase user adoption and familiarity on a platform (Facebook is notoriously bad at this). However, you should consider using Google Posts not because it's new feature, but because it's a useful feature for enhancing the availability of your branded content for searchers.